With Trump on the ballot, Republican Super PACs spend to save Senate. 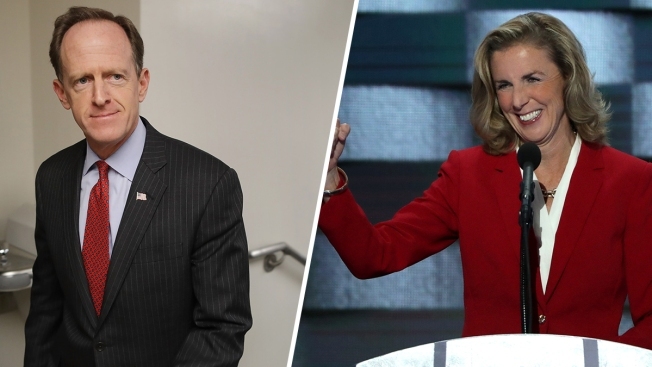 Super PACs have spent $31 million in Pennsylvania this year, most of it for negative ads targeting one-term Republican Sen. Pat Toomey, left, or his Democratic opponent, Katie McGinty, right. Deep-pocketed Super PACs are pouring tens of millions of dollars into key U.S. Senate races, outspending the candidates themselves in several states, according to an NBC analysis of Federal Elections Commission data. Since January, Super PACs have spent just over $100 million in nine Senate races that are rated a toss-up by the nonpartisan Cook Political Report. Those nine races could determine control of the Senate: If Hillary Clinton wins the White House and Democrats flip four seats, the Democrats will control the Senate, with newly elected Vice President Tim Kaine breaking ties. Those races are in Nevada, where Senate Democratic Leader Harry Reid is retiring, and for Republican-held seats in Florida, Illinois, Indiana, New Hampshire, North Carolina, Ohio, Pennsylvania and Wisconsin. Super PACs, which can raise unlimited amounts for federal elections but can’t coordinate with candidates, are focusing on four of those key races: Pennsylvania, Ohio, Nevada and New Hampshire. The other races, particularly Illinois and Wisconsin, where Republican incumbents are struggling to survive in Democratic-leaning states, are getting little attention. Republican incumbents Mark Kirk of Illinois and Ron Johnson of Wisconsin have been considered dead from the start, Sabato said. That’s why the Super PACs are spending most of their money elsewhere. Super PACs have spent $31 million in Pennsylvania this year, most of it for ads trashing one-term Republican Sen. Pat Toomey or his Democratic opponent, Katie McGinty. That’s five times more than Toomey and McGinty together spent on their own campaigns through June 30. They’ve spent $29 million in neighboring Ohio – most of that to bury former Democratic congressman Ted Strickland, who is trying to unseat Republican Sen. Rob Portman. Together Portman and Strickland spent less than $4 million through June 30. Super PAC money began surging into the Senate contests in April, after Hillary Clinton and Donald Trump locked up the Democratic and Republican presidential nominations. Since then, with the exception of a single $50 million expenditure for Trump in June, most of the Super PAC money generally has flowed into Senate races. Republicans Super PACs are dominating the spending spree. Through the end of August, Republican-leaning groups spent $67 million supporting GOP candidates and attacking Democrats in the toss-up races. Democratic groups spent $36 million. They’ve spent most of that money, about $8 of every $10, opposing the enemy rather than supporting friendly candidates.